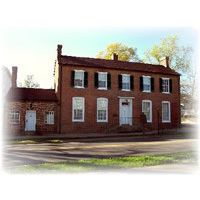 The Brown-Pusey House is the perfect rental facility if you want a warm, personal atmosphere for a party, wedding, or business meeting. Consider the house for your next special event. The formal garden behind the house is a popular site for wedding ceremonies and outdoor events. Total capacity is 300 persons. The main floor of the Brown-Pusey House has a 28' x 39' ballroom suitable for receptions or large meetings. For smaller meetings, you might consider the Poplar Suite, with capacity for 30 guests and located on the second floor. The Brown-Pusey House offers complete kitchens in both areas and an assortment of tables and chairs to meet your needs. Please call for info on our special rental rates for weekday business hours 10am-4pm. Non-profit, businesses, and some private rentals may qualify for additional discounts Tuesday thru Friday only. Rent the 2ND Floor "Poplar Suite"
Two large rooms, with sunroom overlooking Cunningham Garden, full kitchen, and private restroom. Great location for offsite business meetings, bridal showers and luncheons.